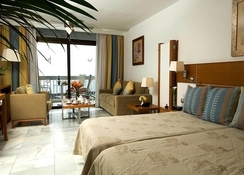 The Palm Beach Tenerife is a home-away-from-home with its massive rooms, exceptional amenities and outstanding service. Beach-front property, half board, buffet breakfast, free Wi-Fi and guaranteed low prices are some of the best reasons to stay in this hotel. The rooms at the Palm Beach Tenerife reflect style and comfort and come with high-tech appliances in a bright living space. Moreover, the wide-ranging rooms, make it possible for solo travellers, couples, families and group of friends to find something suitable. 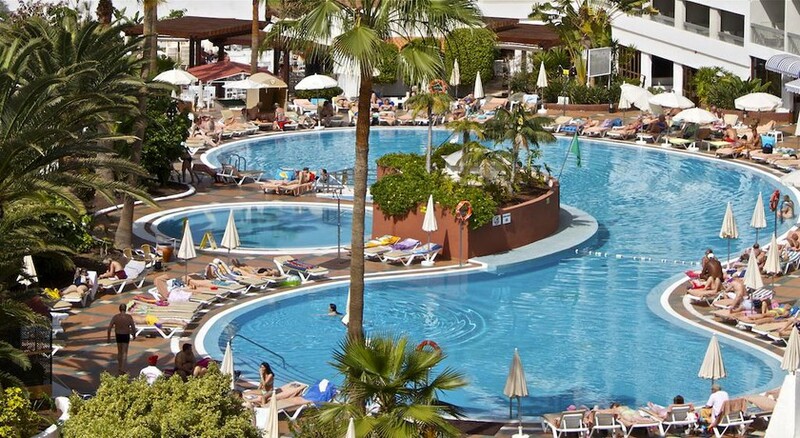 The resort’s guests can directly access the Playa Troya’s sandy sea shores or utilize the on-site lagoon style swimming pool-two delightful options to bask up the Tenerife sun. Plus, you can utilize many other facilities of the hotel that include specialized bike hire, yacht charters, volcano Teide experience, airport shuttle bus and much more. 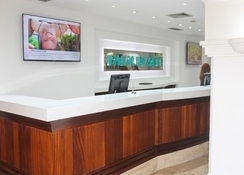 The Palm Beach Tenerife is conveniently situated in Playa de las Americas. It will be an exciting time for beach lovers, as the Playa de Troya Beach is only a kilometre from the hotel. Those who want to satisfy their luxury shopping needs can head to the Siam Mall, which is only 1.2km from the resort. The Tenerife South Airport is only 15.5km from the hotel, making it convenient for the guests to board their flights on time. The rooms in the hotel reflect avant-grade furnishings with massive living areas and leather white sofas, which will ultimately make your stay bright, airy and full of sunshine. They come in three categories that include The Sterling Suites, The White Suites and Standard Rooms. 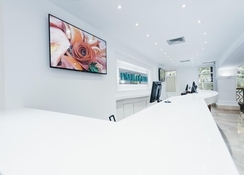 The amenities in the hotel are second to none, which include international television, linen & towels, room safe, oven, microwave, air conditioning, hair dryer, fridge, coffee machine and iron. 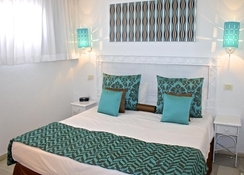 The Standard Rooms have the capacity to accommodate up to six guests. The pool-side dining facility at the hotel ensures that the guests enjoy their meals without having to leave the marvellous pool area. Fresh breads, served right from the ovens-plus a range of breakfast favourites that include sausages, bacon, eggs, fresh fruits, cheeses and cold cuts-cooked as much as you like them are offered. In the evening, you can take advantage of the pool side bar, which serves hot and cold drinks and a vast selection of appetizers-from sandwiches, burgers, enjoyable ice creams to cool salads. Pop down a cocktail or a mocktail at the hotel’s stylish bar that overlooks the ornamental fountain and the botanical garden. In the interior section of the bar, you will find bright interiors and large number of comfortable seats-perfect to meet friends after a long day of fun in the sun or before heading to your suite for a nap. The Palm Beach Tenerife is a magical destination that has so much to offer in terms of sports and recreation. There is an outdoor swimming pool, where you can soak up the sun, while having refreshing drinks on the sun loungers. Those who want to stay in shape can utilize the fully-fledged fitness centre with professional trainers, while your children can have a lot of fun in the children’s club. It was clean and the atmosphere and facilities nearby was really good! Would definitely recommend this place to anyone! Had good activities running at the hotel at the same time! Pool is lovely and you come out of the hotel and the beach is at your doorstep and the strip is literally a 5 minute walk max, probably less than that! Only negative comment is that they don’t replace towels over the weekend! Just back from a 7 day break at this sea view hotel, and I would highly recommend it. It's only about 4 or 5 minutes to the busy resort centre but perfectly situated to get a good night's sleep, we were self catering but eating out wasn't a problem as there were plenty of restaurants close buy all reasonably priced. So we would definitely return the next time we are in Tenerife. Fine hotel in top area. Fine hotel in top area. Room a bit dated but by reports when we’re there they started doing up parts of the hotel. A good 3 star plus.